Basically, there are three types of Brand Architectures, and then a wide variety of hybrids that can be tailored to the unique circumstances of any company. 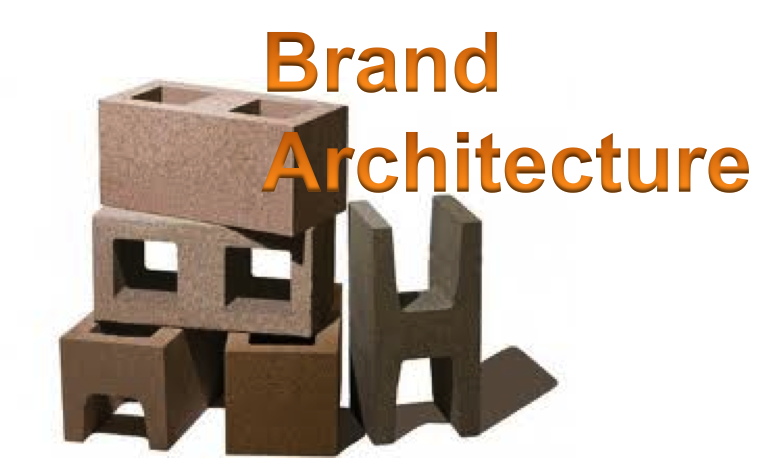 A Masterbrand Architecture is a monolithic structure where, from a branding standpoint, all business units, subsidiaries and divisions share the same brand. The “Masterbrand “ is also sometimes referred to as the “Corporate, Umbrella, Parent or Mono” brand. Good examples of this strategy are FedEx and GE. In general, everything carries the FedEx and GE brand masterbrand and sub-units are defined by their specific lines of business. An Endorsement Brand Architecture uses a common endorsement for all of the operating units, and the parent brand functions in a subordinate manner to each operating unit brand. For example, United Technologies operates as a parent brand as it faces Wall Street, but each operating unit is identified by its own brand with an endorsement. The Sikorsky business is branded Sikorsky, “A United Technologies Company,” but uses the iconic “gear wheel” symbol, as does Hamilton Sundstrand, etc. A Portfolio Brand Architecture keeps separate identities for many or all of its brands if there is sufficient marketing support for individual brands, if it is believed the parent does not provide any brand equity that would benefit the individual brands, or if it is necessary for tax, legal or other reasons. Procter & Gamble manages a portfolio brand architecture. General Motors also manages a portfolio of brands with little overt brand equity supplied by the parent even though it is shrinking. Determining the right Brand Architecture for a company is a complex endeavor and requires a variety of inputs in order to arrive at the optimal structure. Here are some of the key steps. • The media need to have the correct perception of your company in order to accurately and more favorably communicate to their audiences. 2. Be clear about the business vision. Successful architectures have a strong business rationale behind them. To build an appropriate Brand Architecture, you first need to figure out the company’s near and long-term business goals (e.g., acquisition, organic growth, sale or IPO). Consider whether the company might expand its product lines or geographic coverage. 3. Evaluate the equity in your existing corporate, subsidiary, and product/service brands. Brand Architecture demonstrates how your corporate brand and sub-brands relate to and support each other. Therefore, before determining whether a brand in your portfolio will benefit or harm the corporate brand or another sub-brand, you need to have a clear idea of that brand’s perceived value in the lines of business you are exploring. If a sub-brand is strong, it can even become an umbrella brand for a whole family of product extensions. 4. Assess the value of co-branded relationships. Co-branding offers brand exposure in a product class that would be hard to enter on its own and can provide additional brand equity to support a business. It can also have long-term downsides, such as audience confusion from conflicting brand messages or damage to both brands if one has a problem. Consider very carefully whether two or more brands should be used to support a product, service or venture or whether there would be any benefit to endorsing one or more of your brands with another brand. 5. Determine what scale of marketing budget is available. A Masterbrand Architecture is the most cost efficient structure from a marketing investment standpoint because every marketing dollar spent accrues benefit to all of the brands. A Portfolio Brand Architecture is always the most expensive architecture because it requires investment in each individual brand. Therefore, when developing a Brand Architecture, it is essential to know the resource requirements to support your brands. 6. Understand legal or tax implications. Though Brand Architecture is not the same as organizational architecture, certain structures may still have some legal or tax implications. For example, use of a brand owned by a different company or legal entity within the parent organization will often require inter-company license agreements. Furthermore, a group that wants to use a brand may need to license it in different tax jurisdictions, especially if using it internationally. An endorsement or co-branding strategy is more likely to call for an allocation of licensing costs across companies. 7. Develop a plan and timeline to introduce your Brand Architecture. Once you determine the best Brand Architecture for your company, it is important to develop a visual system to introduce and support it. For example, if you are implementing a masterbrand structure, then it will be necessary to conform visual branding to pull everything together. On the other hand, if you determine that having separate and distinct sub-brands better supports the business, you will need an identity system to support that architecture. Importantly, if you plan to phase in or evolve from one architecture to another, there are various “migration strategies” to consider that can facilitate this process without damaging brand equity along the way. 8. Create a decision tree to maintain your Brand Architecture. Once your Brand Architecture is in place, one of the best tools you can use to maintain it is a decision tree that asks and answers specific questions leading to recommendations consistent with the company’s overall brand strategy. A formalized decision tree can take the guesswork out of any future decisions you may face when confronted with branding issues resulting from acquisitions, internal product/brand development, internal readjustment, etc. Net, be intelligent in developing your organization’s Brand Architecture. A successful architecture doesn’t just happen. It requires careful thought. Not formally addressing Brand Architecture risks brand dilution, or at the least, not optimizing the brand assets you already own.